This page explains how to integrate a SuperSaaS schedule into a Joomla based website so that your users only need to sign in once to access both your website and the SuperSaaS schedule within it. To be able to use it you first need to sign up for a (free) SuperSaaS account. If you do not ask your users to log in to your own website, you should follow the general instructions on how to integrate a schedule in your website. The plugin provided here will only work when the user is already logged into your own Joomla site. 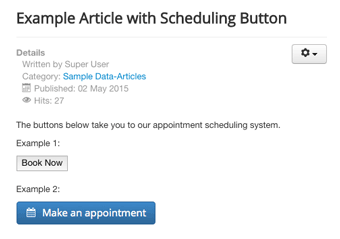 The SuperSaaS Joomla plugin displays a “Book now” button that automatically logs the user into a SuperSaaS schedule using his Joomla user name. If you are not using the Joomla user registration system then you should instead follow the general instructions on how to integrate a schedule in your site. The button generated by the plugin passes the Joomla user database information along to SuperSaaS, creating the user in the SuperSaaS database or updating his information as needed. This saves users from having to create a separate login for the booking system and avoids the need to log in twice. If you want to modify the module you can also download it from our GitHub repository. SuperSaaS API key * – You can find the API key of your SuperSaaS account at the bottom of the Account Info page. For Joomla! 3.2+ it is easy to implement the SuperSaaS plugin using the “Install from Web” option. In the “Install from Web” tab search for “SuperSaaS Booking Plugin”. Open the “SuperSaaS Booking Plugin” and click the green “Install” button. Next, follow the configuration instructions at point 2 above. 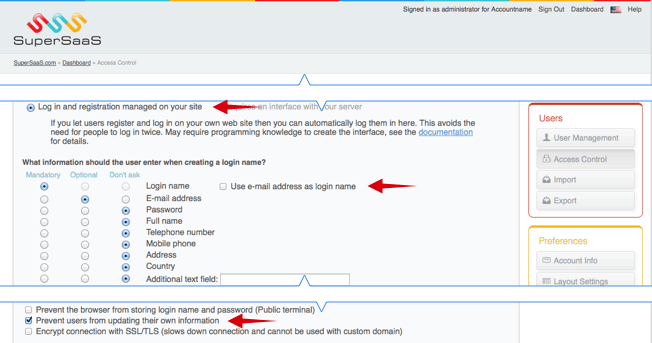 This image depicts the Access Control page in your SuperSaaS account after making the settings described above. You can now try out the button on your site. As the administrator, you will still need to log in through the main SuperSaaS login page so you would want to try this out pretending to be a regular user. If you want to define superusers in SuperSaaS, make sure they have logged in at least once using the button before changing their role on the User Management page. If you see an error Login name is a reserved word, then your user name is a reserved word in SuperSaaS. Try logging in with a different username. If the button redirects the user but does not appear to actually log him in and you have used a URL in the field Schedule name or URL then make sure that the domain of that URL is entered in the Custom Domain Name field.